A single Alaskan king crab can yield over 6 pounds of meat. They can measure up to a 6-foot leg span. A rib roast minus the bone, beef ribeye roast is juicy and full-flavored. One of the most tender beef cuts, it’s fine-grained with generous marbling throughout. Roasts cut from the rib section closest to the shoulder are referred to as large end roasts. Those cut from the section closer to the loin are called small end roasts. Small end roasts contain the largest part of the ribeye, are leaner, have less waste and are slightly more tender than large end roasts. With a sharp knife, anybody can easily carve this boneless roast. Heat oven to 350°F before roasting. Place ribeye roast, fat side up, on rack in shallow open roasting pan. Do not add water to roasting pan and do not cover. For best results, cook beef ribeye roast to medium rare (145°F) or medium (160°F) doneness. Do not overcook. Use ovenproof or instant-read thermometer. Insert thermometer so that the tip is centered in thickest part of roast. Ovenproof thermometers are inserted before roasting and remain in place during the entire roasting process. Instant-read thermometers are not ovenproof and cannot be left in roast during cooking. Use to test roast temperature periodically toward end of suggested roasting time. Prevent overcooking by removing ribeye roast from oven when internal temperature is 10°F below desired doneness. Tent roast loosely with aluminum foil after removing from oven. Let roast stand 15 to 20 minutes. The internal temperature rises 10°F to finish cooking and the juices firm up, making carving easier. Method: In a large stock pot melt down butter over medium high heat, add garlic onions and chipotle sauté until tender. Add the remaining ingredients and simmer for forty five minutes stirring constantly; when the pods burst remove the casing leaving the grounds. After forty five minutes have passed remove from heat and strain using emersion blender to separate. 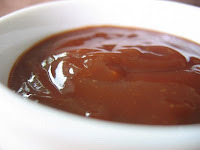 Discard left over pulp, date label and store sauce properly after cooling. Method: Combine all ingredients in a large bowl and mix until thoroughly incorporated. Date, label, and store in an air tight container. I was canning away the other day putting up pickles and spicy pickled green beans, carrots, and daikon. Somewhere I stumbled across a recipe for a spicy crab pasta with preserved meyer lemons. Sounded good so I had to google around and find preserved lemons. It's incredibly simple, lemon, lemon juice and salt are your only ingredients- and then a little time for everything to mingle. 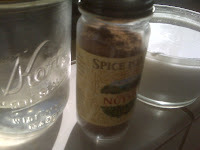 Sterilize jars then add about 2 tblsp of kosher salt to the bottom. Wash lemons and scrub well. Cut lemons almost through into quarters. Squeeze out as much juice from the lemon into a bowl and reserve. Salt the lemon inside and out and stuff in jars. Top with lemon juice until 1/4" to the top of jar and seal. Steam can 20 minutes to seal. It takes about 4-6 weeks before you can use your lemons. Here is a list of recipes for preserved meyer lemons. Cook spaghettini in a pasta pot of boiling salted water (3 tablespoons salt for 6 quarts water) until al dente. Meanwhile, cook onion in oil in a large heavy skillet over medium heat, stirring, until softened. Stir in sambal oelek and cook 1 minute, then add crabmeat. Reduce heat to low and cook, stirring frequently, just until crabmeat is heated through. Drain pasta, then add to skillet along with remaining ingredients and toss to coat well. Here is a reference for more preserved meyer lemon recipes. side dishes. It will be populated with business solutions, product information, tips and new ideas ready to be applied to your operation — immediately. There’s plenty of food in foodsight— with a stockpile of product information, recipes, and demonstration videos! Foodsight is another way U.S. Foodservice® is going Beyond The Plate to help make your business bigger and better. 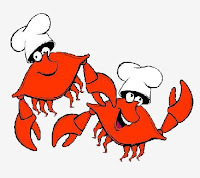 America’s best selling crab is the blue crab from the East Coast, followed by the West Coast Dungeness crab, King Crab from Alaska and Florida Stone Crabs. This hearty Rutabaga Brassicca napus, superficially resembles the common turnip, Brassica rapa. However, the rutabaga is endowed with more carbohydrates, sugars and vitamin C, has a firmer flesh and keeps longer. It is actually a member of the cruciferous vegetable family, along with Kale and Cabbage. In fact it is said to be a hybrid of wild cabbage and turnips. Because rutabagas thrive best in colder climates, they became popular in Scandinavia, but especially in Sweden, the country that earned them the name "swedes," the name is derived from the Swedish words for "thick root." 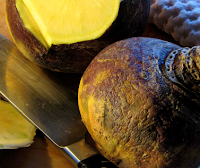 In Europe, rutabagas are still called swedes. In America, rutabagas were first cultivated in the northern parts of the country in the early 1800s. Canada and the northern states are today's greatest producers of the rutabaga. The Irish brought the tradition of the Jack O'Lantern to America. But, the original Jack O'Lantern was not a pumpkin.The Jack O'Lantern legend goes back hundreds of years in Irish History. As the story goes, Stingy Jack was a miserable, old drunk who liked to play tricks on everyone: family, friends, his mother and even the Devil himself. One day, he tricked the Devil into climbing up an apple tree. Once the Devil climbed up the apple tree, Stingy Jack hurriedly placed crosses around the trunk of the tree. The Devil was then unable to get down the tree. Stingy Jack made the Devil promise him not to take his soul when he died. Once the devil promised not to take his soul, Stingy Jack removed the crosses and let the Devil down. Many years later, when Jack finally died, he went to the pearly gates of Heaven and was told by Saint Peter that he was too mean and too cruel and had led a miserable and worthless life on earth. He was not allowed to enter heaven. He then went down to Hell and the Devil. The Devil kept his promise and would not allow him to enter Hell. Now Jack was scared and had nowhere to go but to wander about forever in the darkness between heaven and hell. He asked the Devil how he could leave as there was no light. The Devil tossed him an ember from the flames of Hell to help him light his way. Jack placed the ember in a hollowed out Turnip, one of his favorite foods which he always carried around with him whenever he could steal one. For that day onward, Stingy Jack roamed the earth without a resting place, lighting his way as he went with his "Jack O'Lantern". 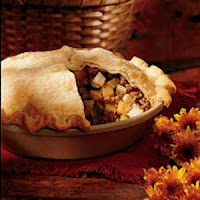 Rutabaga lends a deep, complex flavor in pie and contains nearly half the calories and about twice the vitamin C of pumpkin. Red king crabs and Opilio crabs are caught in 600-800 pound metal pots that are baited with ground herring, sardines or cod before they are dropped 400 feet below the surface. Since crabs do not appear on radar or migrate in the same pattern each year, captains must rely on their experience and intuition to find the best locations to fish. Fishermen are allowed to harvest only adult male crab. All females and juveniles must be thrown back. If a crab dies in the boat’s holding tank, it emits toxins that can poison the other crabs; one dead crab has the potential to wipe out the entire catch. Red king crabs are the largest crab species, weighing an average of six to 10 pounds (with the record female and male weighing 10.5 and 24 pounds, respectively. The male’s leg span was nearly 5 feet across). Opilio crabs weigh an average of one to three pounds. YOUNTVILLE, Calif., Dec. 16 /PRNewswire/ -- Hotel Luca officially opened today in Yountville, California. The ideal setting for couples or small groups, the 20-room property features Cantinetta Piero restaurant, full-service Luca Spa and two residences. The architect for Hotel Luca was Jeffrey Fink and Associates Architecture of Los Angeles. The hotel interior, created by Kathleen Fink of KMF Design located in Carmel, California, combines casual luxury with modern textures and tones. Premium home furnishings brand Restoration Hardware was enlisted to furnish throughout, lending a timeless design aesthetic to the interiors and surrounding gardens. Restoration Hardware's expert craftsmanship and classic style can be seen in the hotel's assortment of custom beds, chairs, tables, desks, lighting, patio decor and more. Unique reclaimed materials were used throughout the construction of Hotel Luca including 200 year-old roof tile from Lucca, Italy, and 300 year-old floor tile from Florence, Italy. The hotel's exterior is of custom lime-plaster, an ancient technique used on some of Europe's earliest buildings. Locally quarried Napa Valley Syar stone frames the hotel's portico tower entrance. Rustic Jerusalem limestone can be seen throughout the property's lobby, spa, bathrooms and public spaces. Together with Kathleen Fink of KMF Design, New York glass artist Susan Joblon designed the glass patterns and color palettes used throughout Luca Spa, Cantinetta Piero and the hotel's guest rooms and pool area. Guest room colors reflect the earth tones of the wine country and are sophisticated and pleasing, thoughtfully appointed with every modern amenity and convenience including flat-screen television, ceiling fans, music system and complimentary WiFi. Dark-toned Restoration Hardware furniture, upholstered with imported fabrics for ultimate comfort is complemented by fine art photography by local artist JE Knubis, images selected for inspiration and beauty. Every guest room features custom Restoration Hardware beds with imported Mascioni Italian linens, New Zealand wool carpeting, and generous bathrooms with radiant floor heat, double sinks, soaking tubs and separate showers. All of the guest rooms have balconies or patios with sitting areas, and some feature fireplaces. Accommodations include complimentary valet parking, highly personalized guest service and a delicious country breakfast daily. General manager James DeLuca is excited to introduce Hotel Luca, Cantinetta Piero and Luca Spa to travelers and the local community. "We have assembled an outstanding hospitality team to provide guests with the highest level of service," states DeLuca. Cantinetta Piero is inspired by the convivial attitude and open-air lifestyle of Tuscany. Under a lofty 15-foot high ceiling with massive beams and vaulted brick ceiling, seating areas include banquettes, tables, the pizza bar and, through large sliding glass doors, an outdoor courtyard dining area. The restaurant features an open kitchen customized by the Montague Company, with a Mugnaini Italian wood-burning pizza oven, an Italian hearth bread and bakery oven, and its own salume curing room. The foods of Tuscany are at the heart of Cantinetta Piero menus. Christopher Vacca, chef de cuisine at Cantinetta Piero, oversees the kitchen and the menus he created in collaboration with Jason Balestrieri, the executive chef for both Cantinetta Piero and Cantinetta Luca (Carmel, CA). Vacca has worked with several of the country's most notable chefs including Mark Miller at Red Sage, Jean-Louis Palladin at the Watergate Hotel and with David Burke at Park Avenue Cafe. He has a firm understanding and love of Italian food, having been raised in a first-generation Italian family. The menus focus on seasonal ingredients and regional products including seafood and shellfish from the nearby coast, game and meat from the inland and mountain regions, and produce from local farms. Diners will find items such as (partial list) eight varieties of salume, house-made pastas, (bucatini con due uova, pumpkin ravioli), ribolilita soup, bistecca alla fiorentina, cacciucco (fisherman's stew), Anantra (roasted duck breast, farroto, chantrelles, pomegranate) and a selection of ever-changing specialty pizzas all baked in an authentic Italian wood-fired oven. Greeting arriving guests at Cantinetta Piero is general manager Michael Galyen, a familiar face to many residents of the Napa Valley. Former general manager of Bistro Don Giovanni and most recently assistant manager at Bottega, Galyen has more than 20 years of experience in fine-dining establishments. The wine list at Cantinetta Piero focuses on the Napa Valley and the great wine regions of Italy. Vintages are on display in a ceiling-high, glass-fronted wine room. Approachable, fun, lively, Cantinetta Piero offers modern Tuscan food from a Napa Valley point of view. Luca Spa embodies the Napa Valley and Tuscan philosophy of love of life and wellness of being. The spa provides a relaxing environment for professional, personalized, nourishing services for body and soul and features a signature lavender-saltwater soaking pool complete with water wall and fireplace. Guests can indulge in a variety of traditional therapies or more contemporary treatments including, citrus refresher massages, terra purification cleansing treatments, aqua pura hydrating facials, personalized wellness solutions and a selection of pampering couples treatments. Designed to be alive, flowing and spontaneous, Hotel Luca embraces the beautiful light of the Napa wine country. Surrounded by antique shops, art galleries and wine tasting rooms, the new Hotel Luca is located in the town of Yountville. From Hotel Luca's rooftops, 200-year-old tiles from the town of Lucca, Italy, peer down at open terraces and patios, arched windows and the casual luxury of tastefully appointed guest rooms featuring Restoration Hardware custom designs. With a villa-like stone tower, arched walkways and European lime plaster, Hotel Luca combines the best of contemporary design and old-world architectural passion. In addition to its 20 guest rooms, Hotel Luca offers two fully-furnished residences for stays of thirty days or more. Featuring all the appointments and amenities of guest rooms, the residences are complete with fireplace, radiant floor heat bathroom, full kitchen and enclosed balcony. All the services of the hotel and restaurant are available including twice-daily housekeeping service. For more than 25 years, Mirabel Hotel & Restaurant Group owner David Fink, has been associated with some of Northern California's finest luxury resorts, hotels and restaurants. Fink's 'heart of a servant' philosophy and constant focus on guest satisfaction has ensured success of all properties under the company's direction. Fink opened Bouchee, his first restaurant in Carmel, in 2002; it quickly became the region's premier choice for fine dining. 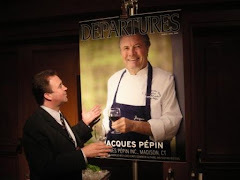 (Mirabel sold Bouchee in 2009) In 2004, L'Auberge Carmel, a luxury inn and restaurant, member Relais & Chateaux, opened in the heart of Carmel-by-the-Sea, cementing Fink's reputation as a dedicated and innovative hotelier. It was also the beginning of Mirabel Hotel & Restaurant Group, the management company Fink and his wife Kathleen started with the dual purpose of managing a growing list of properties as well as exploring possibilities for new acquisitions. The Group's third restaurant, Cantinetta Luca (Carmel) opened in 2006, offering Italian food in a casual, modern setting, and consistently receiving critical accolades and awards. Hotel Luca is the Group's newest venture. Inspired by Tuscany and created for Napa Valley, the team that created L'Auberge Carmel, restaurants Aubergine and Cantinetta Luca, have brought their vision to Hotel Luca. If a crab loses a limb, it will grow back. In fact, only the claws of the Stone Crab are eaten. So, if a crabber catches a Stone crab he/she will tear off the claws and throw the rest of the crab back to sea where it will regenerate the claws within 18 months. A grilled sandwich made with corned beef, Swiss cheese, sauerkraut, and Russian dressing on rye bread. There are a couple of legends or stories involving the creation of the Reuben Sandwich. I can find no actual evidence to support either claim. You be the judge! I’ll tell you about how I got the sandwich idea. I owned a delicatessen on Broadway and one day a dame walks in, one of the theatrical dames, and she’s down and out I suppose, and she asks me for something to eat. Her name was Anna Selos. Well, I’m feeling sort of good, so I figure I’ll clown around for the dame. That’s how it all came about. I’m clowning for the dame. Well, what do I do? I take a holy bread that I used to keep and grab up the knife and, you know, clowning like, I cut it right through on the bias. Then I take some roast beef, I don’t remember exactly what. But, anyway, I figure I’ll put anything on. So I take some meat and cheese and I slap it on, and I put on some spice and stuff and I make her up a sandwich; it was a foot high. Well the dame just eats it, that’s all. She must have been plenty hungry. And when she gets through she says, “Mr. Reuben, that’s the best sandwich I ever tasted in my life.” Well, the idea comes to me in a flash. I’ll call it the Anna Selos sandwich, after the dame. Then, one night, she brings some friends up, you know, stage people and a newspaper man, and this guy he goes right behind the counter and makes himself up a sandwich, and then he tells me why I don’t call the sandwich after celebrities? Like what happened with Anna Selos. Why don’t I call it the Anna Selos sandwich? Well, boys, in a flash, I get the idea. Anna Selos! I’ll call it a Reuben Special. 1925 - Another version is Reuben Kulakofsky (1873-1960), a wholesale grocer in Omaha, Nebraska and co-owner of Central Market in Omaha from 1900 to 1943, created the Reuben Sandwich. Kulakofsky belonged to a weekly poker group whose members apparently enjoyed fixing their own sandwiches every bit as much as they enjoyed playing poker. One of the players, Charles Schimmel, owner of the Blackstone Hotel in Omaha, put the Reuben Sandwich on the hotel menu. The Reuben Sandwich is unquestionably one of New York's greatest contributions to the world of eating and is found in restaurants in all of the major cities of North America. The sandwich was invented by William Hamerly, a New York accountant and bachelor cook. He named it for Arnold Reuben, founder of Reuben's New York Restaurant. Arnold Reuben has done a great deal of work for New York charities. He, in fact, received several awards for his charitable work. Hamberly named the sandwich for Reuben, not because he founded the famous Reuben Restaurant, but because he admired his charitable works. Like any really outstanding cooking recipe, the Reuben Sandwich spread over all of North America and even into Europe in a very short time. 1956 - Fern Snider, chef of the Rose Bowl Restaurant in Omaha, was named grand prize winner in the 1956 national sandwich idea contest sponsored by the National Restaurant Association. The Reuben Sandwich obtained almost immediate national fame. According to the September 1956, American Restaurant Magazine, in an article titled "National Sandwich Winners:"
THE RUEBEN, a hearty man-sized sandwich of corned beef, sauerkraut and Swiss cheese on Russian rye bread, is the nation’s top hotel and restaurant sandwich in the opinion of judges of the National Sandwich Idea Contest in which more than 600 different sandwich items are entered from all parts of the country and Hawaii. The Rueben was submitted by Fern Snider, chef at the Rose Bowl Restaurant in Omaha, Nebr. The Rachel sandwich is a variation on the standard Reuben sandwich that substitutes pastrami for the corned beef and coleslaw for the sauerkraut. Mmmm. Smell that? It's the scent of BACON MANIA. There are bacon blogs, bacon cookbooks, bacon-scented air fresheners, bacon tweets and a book entitled Bacon, A Love Story. "Bacon Butties" has more than 500,000 fans on Facebook. "Bacon mania" even has its own Wikipedia entry. The pairing of salty bacon and sweet desserts has been gaining popularity. The recipes provided by NPR for cookies, fudge, cake and other desserts made with bacon show why the combination is addictive to so many. Although pasta was generally associated with Italy, and indeed many of the varied shapes originated from that country, the first pasta was actually Chinese. The development of an agricultural civilization led to pasta, possibly around 3000 B.C. ancient Greeks considered pasta "marcus"—meaning "divine food." An Etruscan tomb created around 400 B.C. depicted the making of the grain product. Horace, a poet who lived in the first century B.C., described lasagna as one course of a Roman banquet. Pasta was also a part of the cuisine of the Middle East. The Jewish and Arabic cultures, as well as that of Persia, discussed pasta as well as noodles. Germans consumed it, and the Genoese ate it in the thirteenth century. All of this took place before Marco Polo's legendary expedition to China, which led to the widespread consumption by Italians, who added red tomatoes to the recipe. Noodles were consumed in the New World, prepared in the manner popular among the British—accompanied with a cream sauce and cheese. 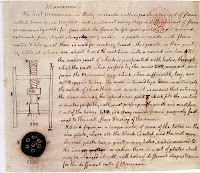 Thomas Jefferson was the first prominent American to embrace pasta, when he purchased a "macaroni" machine in Italy and shipped it to the United States. An Italian restaurateur in Richmond, Virginia, served pasta to his influential clientele, which included Jefferson. By 1848, French miller Antoine Zerega opened the first macaroni factory. He followed both Chinese and Italian traditions, drying strands of spaghetti on the rooftop of his Brooklyn factory. The subsequent immigration of large numbers of Italians to New York helped bring pasta into the mainstream of American cuisine. 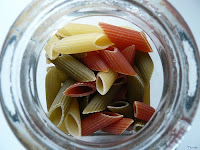 A subtle wheat flavor was considered the ideal taste for pasta, since blandness prevented the pasta noodle from competing with the flavor of the sauce. The ideal texture of pasta was obtained when it was cooked "al dente." This translated from Italian literally as "to the tooth," but it described a noodle that was firm when chewed. In the two decades from 1975 to 1995, Americans increased their pasta consumption by 90 percent. Pasta was manufactured almost exclusively in the United States from durum semolina wheat. A growing consumer preference for nutritious, low-fat foods boosted the health of the industry, nearly doubling mean annual per capita consumption in the last 20 years to 24 pounds. In 1995, the typical consumer ate pasta an average of 2.7 times a week. The increased consumption was also due to a shift in consumer perceptions: it gained popularity among middle class and affluent adults and seniors, rather than beingviewed as a meal for children or the working poor, as was the case during the 1960s. However, a shift toward low-carbohydrate diets in the late 1990s began to under-mine dry pasta sales. The value of industry shipments declined steadily in the late 1990s, falling from nearly $1.8 billion in 1997 to $1.2 billion in 2000. During this time period the number of employees in this industry declined from slightly more than 6,000 to roughly 4,300. There is a vast difference between a rolled or laminated pasta and an extruded pasta. First it is important to understand the different processes utilized to make an extruded versus a rolled or laminated pasta. Extruded pasta is formed by virtue of force. A worm or screw housed within a barrel turns at a continuous rate forcing mixed pasta dough down this barrel. Once the product reaches the end of this barrel, it encounters a die. An "extruder" die is usually a flat object of substantial thickness with various openings on its surface. The shape of these openings determines the shape of the final product. Extruded pasta is the type of pasta commonly seen on the grocery store shelves (Barilla, DeCecco, Ronzoni, etc.). Rolled pasta is formed by passing mixed dough through a set of adjustable opening rollers several times to form a continuous sheet of pasta dough. Each time this sheet is passed through the rollers, the space between the rollers is decreased making the sheet thinner. The force applied by a set of rollers strongly integrates the sheet giving it resiliency and strength. Once the sheet reaches the desired thickness, it is passed through a set of cutting rollers. These rollers are not adjustable and determine the final width of the product. *Rolled pasta is up to 50% less dense than extruded pasta. 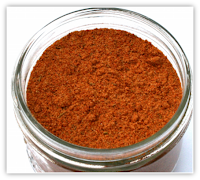 This makes the final cooked product lighter or more delicate. *The thickness of the final product is completely adjustable with a rolled product. One could make pasta that is almost transparent. With an extruder, you are limited by the die. The final product is always the same thickness and shape as the openings in the die. *Rolled pasta cooks in 1/2 to 1/3 of the time that it takes to cook extruded pasta. *Rolled pasta is known to be more porous and therefore holds sauce better. *During formation, extruded pasta experiences a great deal of pressure, heat (from friction) and twisting (from the motion of the worm). In many cases, water is used to cool both the product and the machine. These factors cause internal stress on the pasta which leads to a compromised product quality. This compromised quality explains why extruded pasta does not hold sauce as well as rolled pasta and also why expensive drying units are necessary to dry extruded pasta. *Vast fluctuation in recipe formulations are possible when you are producing a rolled pasta. Such gourmet ingredients as cracked pepper, basil, grilled radicchio, etc. can be laminated into the dough. Ingredients such as these would clog up die openings and render an extruder useless. I was up in the Bay Area one Saturday and while Amanda was working I visited the Shadelands Farmer's Market in Walnut Creek. Of course all my neighbors from the Central Coast were there, selling. There were a couple interesting booths though like the olive people. They sold several different varieties of cured olives, tapenades, and one of their best sellers..the Dirty Martini Mix by the quart bottle. The other booth that caught my attention was Scream Sorbet. Scream based in Emeryville has been around just under 2 years. It's creator Nathan Kurz who was an engineer and foodie. He invested in a Pacojet a unique piece of Swiss machinery that pulverizes sub-zero frozen whole ingredients at a rate of 2000 rpm, turning it in seconds into the smallest possible particles That process is not available anywhere in the world for retail ice cream," boasts Goldner, "only a few high-scale restaurants use it." Besides the amazing texture, the process enables the Scream team to experiment easily and endlessly, making and tasting combinations with the ingredients they just purchased. I had an amazing Coconut Sweet Potato Pie Sorbet taster and forked over my $9.00 for a half pint. The ingredients were Happy Boy Farms Organic Sweet Potato, sugar, water, coconut milk, and organic spices. I gave a home recipe a shot with a slightly smaller budget. 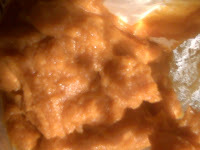 The PacoJet is about $4000.00 so I skipped that and broke out my cusinart ice cream and sorbet maker($65.00 at Costco a year ago) I popped open a $1.25 can of organic sweet potato puree, some homemade simple syrup, coconut milk, and conventional spices. Turned out quite good! In a blender combined all ingredients until well mixed and flavors were right. 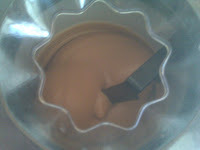 Scoop into ice cream maker and spun for 18-20 minutes and into the freezer. December 10th from 11a.m.-2p.m. Cooking demonstration and Roederer estate lunch with chef Roy Yamaguchi followed by private luncheon, 6-10p.m. Four-course prix-fixe meal paired with champagnes, sparking wines, Dottie Dodgion jazz trio and chefs Roy and Pablo Mellin Thursday. Dec. 10, at The Inn at Spanish Bay, 2700 17-Mile Drive, Pebble Beach. $95 lunch, $98 dinner. Reservations. 647-7500. Win a Weekend Get-Away for Two! Enjoy special offers on your tour of our restaurants and spa, and enter our monthly drawing for a FREE weekend for two. Vista Blue Spa: Enjoy 20% off any 50-minute Spa Treatment and receive a special Spa gift! Schooners Bistro on the Bay: Purchase any two alcoholic beverages and get a FREE appetizer of the day! Duck Club Grill: Purchase one entree, get the second at 50% off! Cafe La Strada: Purchase any freshly-baked pastry and get a FREE small cup of Peet's Coffee! Pick up your Passport to Savings at any of our outlets, and have each panel stamped at the time of service. When completed, present at the Front Desk for your chance to win! Call 831.646.1700 or visit us at www.montereyplazahotel.com today! Must call direct 1-800-334-3999, must be booked by Dec. 14, travel dates Nov. 29 through Dec. 25, Sunday through Friday only. Based on availability, not available to groups and cannot be combined with any other offers or promotions. Upgrade to balcony room for $30. Enjoy a strolling dinner (see menu below) with wines from some of Monterey County’s finest vintners, then dance the night away at this must-attend black-tie optional gala. During the highlight of the evening—the 4th Annual Large and Rare Bottle Auction—join in for the chance to take home a special memento or unique gift. Individual bottles, flights, mixed cases, and other luxury items will be auctioned live. It promises to be a lively evening! At this idyllic Santa Lucia vineyard setting, sample delicious fare prepared by Chef Todd Fisher while winemaker David Fleming explains how and why each wine and food pairing was selected. Then, tour the vineyards and learn about Paraiso’s varietals, terrior, and viticultural practices that helped earn an impressive 92 points from Wine Spectator for their 2007 “Estate” Pinot Noir. Educational and fun! Sit down to a scrumptious five-course meal at this historic, Salinas chop house, and delight in the entrée of your choice, either Macadamia Crusted Halibut, Roasted Rack of Pork or New York Steak, paired with 2006 Joyce Vineyards and Chateau Christina Chardonnay, Pinot Noir, Merlot and Cabernet Sauvignon. The perfect finale to a week-long celebration of gourmet food and fantastic Monterey County wines. 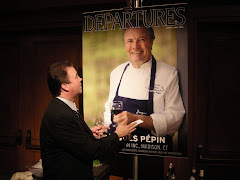 At past events, more than 70 wineries, chefs and restaurants have dazzled attendees with mouth-watering delicacies and wines. Winners will be drawn for the $10,000 Grand Prize Reverse Draw, and Silent Auction items will be on display throughout the evening, including jewelry, vacation getaways, golf packages and much more. Tickets to all four events at a 10% discount, plus two Reverse Draw tickets. benefit Salinas Rotary's local charities. The Restaurant at Ventana Inn & Spa in the heart of Big Sur utilizes local, sustainable ingredients from California's Central Coast. The lodge-like atmosphere is cozy yet casual. Chef Dory Ford's goal as we learned, is to educate and to ...Read the full story here. Male crabs with one large claw use this to attract females. This claw is not used for defense or to attack, but to lure the females for mating purposes. Recently Jim Henzi of Sierra Meats and I were discussing great steakhouses with Pat Ottone, who has a great steakhouse himself in downtown Monterey. Jim insisted that we had to take a trip up to visit Alexander's Steakhouse an independent restaurant located in Cupertino since 2005 owned and operated by James Chen and Executive Chef Jeffrey Stout. It is a fine dining interpretation of the classic American Steakhouse with hints of Japanese influence laced into the menu. 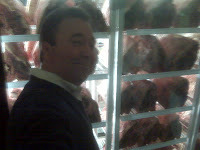 So on a recent Tuesday night Pat and I left Monterey about 5pm towards Cupertino to Rendezvous with Jim and Angie Porter, the Sierra Meats sales representative that works with Alexander’s to source their meats and seafood. We made one stop in Gilroy where Bruce Raymond senior district manager with US Foodservice SF loaded the two of us in his truck and we three continued on our way. through the dry age room was one of two kitchens. JC Chen, one of the owners of Alexander’s greeted us here and took us to meet Chef Jeffrey Stout. As we moved past the dry age room there was what looked like a retail meat counter. The top shelf of the lighted glass case contained each cut available on the menu of the CAB steaks. 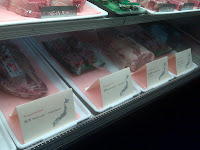 The bottom shelf had subprimals and portion cut Waygu steaks from 5 different regions of Japan, and two regions of Australia. Chef Jeffrey Stout took us down the hall to the front kitchen and gave us a quick impromptu tour starting in the non-meat kitchen, where you can book a Chef’s table for six people. We continued back through the pastry kitchen and back up to the prep kitchen. Finally we went back town the hall to the meat kitchen. There is an upstairs group room and under the upstairs loft a VIPs room that puts you right in the action among the servers and expeditors. An interesting feature from this room is a wall projector from which the servers can view all kitchen areas and can see when their appetizers, entrees, sides, and desserts are up and ready for pick up. These kitchens were set up for production, and they are staffed for production as well. In recollection we guessed there had to be 25 people staffing the kitchens, including 5 in the pastry station alone. The meat kitchen was a compact little area starting at one end with a thermal immersion circulator in a water bath for poaching lobsters and the sous vide lamb products. At the other end of the meat kitchen was a showcase grill that can handle about 50 steaks at any given time. The grill is nearest the dining room and has a glass window that opens out towards the lounge. This is a focal point and the vision, the sounds and the wonderful aroma really sell the sizzle. 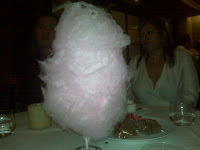 We were seated in the dining room and Chef began to send out goodies. We were started with Amuse Bouche of house made lamb sausage, and then a scallop encroute. At this point JC sent out a great Riesling to prepare us for our next tasting from the appetizer menu. Delicious 6 count King Crab Legs drizzeled with a spicy butter. 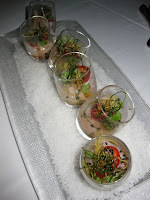 We began with the signature Hamachi Shot, a slice of Hamachi, fried ginger, fried scallion, fresh red jalapeno chili, avocado, truffle oil sesame seeds, micro green wasabi and a ponzu sauce. The second appetizer was Jamón Serrano, a Spanish dry cured mountain ham, called a mountain ham because the drying sheds are usually at a high altitude the hams are dry cured for up to 18 months. This was sliced thin and served on seeded cracker bread with tomato and goat cheese. 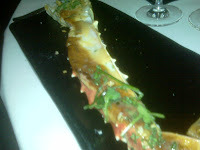 Finally was a stack of split king crab legs with a slightly spicy melted butter. The legs must have been between 6-12 ounces each and were so delicious. 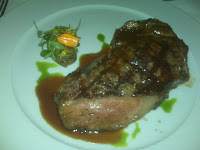 I ordered the mushroom ox tail soup and a 26 ounce-28 day aged bone in New York steak. The soup came in a shallow, wide rimmed bowl with the oxtail in the center tucked safely under a gruyere crouton and the mushroom soup surrounding it. My Certified Angus New York was a perfect medium rare, and Chef Stout has it served on a plate with the lower front corner of the steak cut exposing the beautiful warm red interior. The slice that has been removed is tucked under the top of the steak and provides height to the steak on the plate. At Alexander’s the pos ordering system is all electronic, with the exception or a re-fire, a dish that has to be returned to the kitchen for some reason. These are identified by a pink hand written ticket. JC says the professional staff takes pride that they receive very few pink tickets, and that the process of cutting the corner of the steak allows the server to address the issue of doneness immediately as the customer has an opportunity to view the doneness as the steak is set on the table. The experienced grill professionals at Alexander’s understand that the interior of a cut of meat may still increase in temperature 5-10 degrees after being removed from the grill or oven, and the meat is therefore allowed to "rest" before being served. 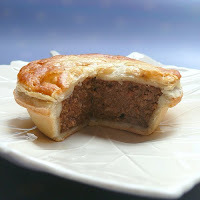 Resting allows the temperature of the meat to stabilize and, importantly, for juices in the center to return to the edges. The center will also continue to cook slightly as the hot exterior continues to warm the comparatively cooler interior. With our entrees we ordered truffle mac and cheese, creamed spinach, truffle fries, and saffron rissotto. These we passed family style around the table. JC sat and dined with us and discussed the concept and his background. JC is a Korean born Chinese immigrant. His family moved to Kansas where he literally got his first taste of Midwestern corn fed beef. In his traditional family he was expected to become a doctor, a banker, or an accountant, but after graduating with a degree in business from the University of Texas he disappointed his family when accepted a management position with a then new concept called TGIFridays. He then moved on to join the Tavistock Group running a California Café concept, and this is where he met Chef Stout. Chef Jeffrey Stout is of mixed heritage being half Japanese and half American. His cooking reflects his soul and blends the best that both cultures have to offer. Chef Stout graduated cooking school in 1988 and has worked for some of the Bay Area and Napa’s best restaurants working his way up from cook to Executive Chef. His vast experience, culinary training, and dogged hard work earned him the position of corporate chef and Research and Development Chef for California Café’s before he partnered with JC to open Alexander’s Steakhouse. Rather than dwell on his history here visit his website and read about it in detail, first hand in his own words. It is obvious that he is a craftsman and appreciates the time and lessons he learned coming up that have made him the professional Culinarian and business person that he is. During our evening at Alexander’s he was gracious and generous with his time. He opened the kitchen to us, and provided unexpectedly generous surprise plates while we dined. Our evening at Alexander’s was fantastic. JC Chen and Chef Stout have an operation that runs like a well oiled machine. The professional servers were plentiful and efficient. The flavors, presentation, and variety of dishes were amazing. On our trip back we discussed our experience there from start to finish. The next morning I changed my Facebook status to “I want to bring my leftover steak out to show off to my customers.” It was a dining experience with an afterglow. I have vowed to make two more trips there with friends soon! Monterey's own Chef Burt Cutino, Chief Operating Officer of the Sardine Factory is featured as one of the judges for the National ProStart Invitational culinary competition. The Invitational is an intense, three-day culinary competition sponsored by the National Restaurant Association and is composed of two distinct competitions: culinary and management. It involved approximately 80,000 student participants in more than 1,650 schools, across 47 states, territories and districts. 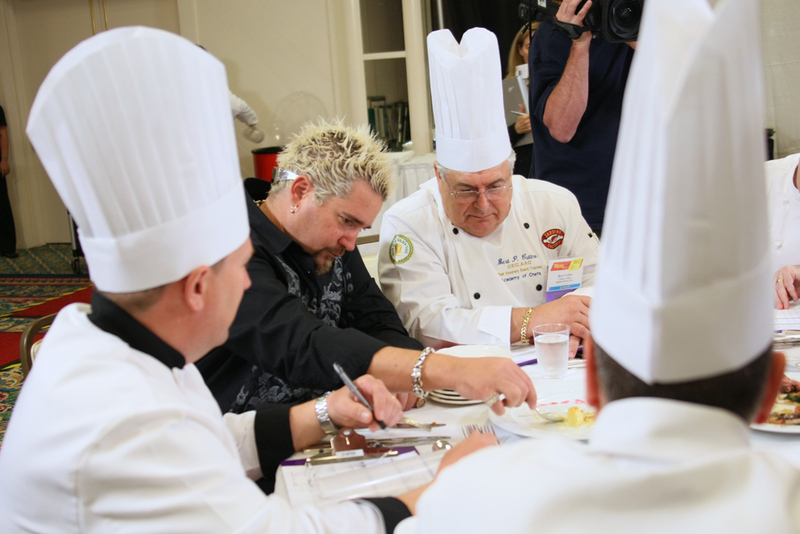 Watch the show as Guy Fieri's Top of The Class is a behind the scenes look at one of the toughest culinary competitions around; exacting judges, an unforgiving clock and... all the competitors are teenagers. We reveal what happens when aspiring chefs, future restaurant owners and kids who passionate about food gather in San Diego for the National ProStart Invitational. 39 teams of top high-schoolers compete for almost 1.1 million dollars in cash, prizes and scholarships. Guy Fieri is the host as the students race to complete a three course meal before the one hour clock ticks down. The pressure is on, because winning this competition will change someone's future. The naturally sweet way to end your year. Add honey’s magic touch to the holidays. Prepare rich and moist honey fruit cakes, colorful honey Christmas cookies and honey Christmas breads for everyone to enjoy. Sweet Treats. Showcase honey's golden touch in holiday inspired desserts and baked goods. Trying staging a "Cookie Cut-Up" contest for your customers. Have honey cookies in holiday shapes baked and ready to decorate. Supply colored frostings and edible decorations. Winners take home a gift basket of freshly-baked honey treats.